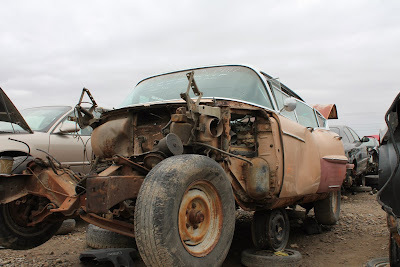 For those of you who are unfamiliar with the Johnny Cash tune, 'One Piece at a Time', it profiles a Cadillac worker who builds his dream Caddy one small piece a day from smuggled parts. In a way, this well picked over carcass (Get it?) 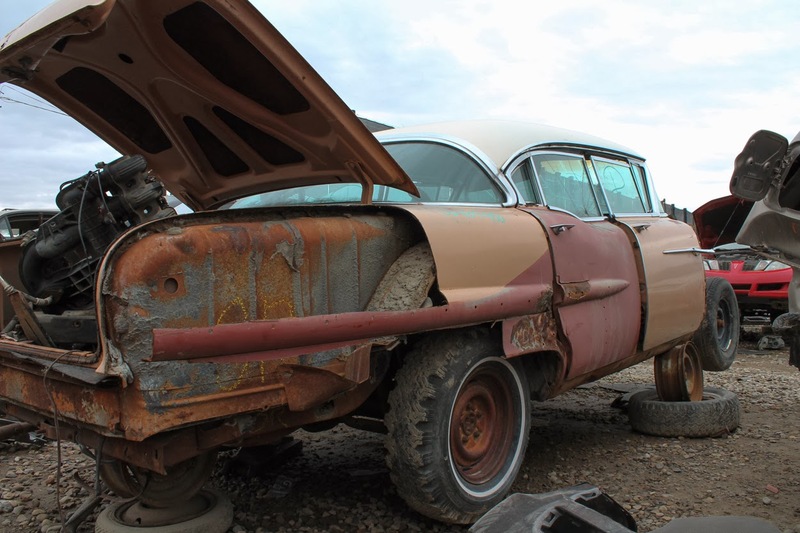 of a 1958 Cadillac Sedan DeVille represents the opposite of that song. Because piece by pice, this once regal symbol of wealthy America has been reduced to a shell. The rosy tinted picture above represents what the car looked liked when it was freshly made 55 years ago in 1958. On American streets, nothing made a statement quite like owning a Cadillac. It was the car people aspired to own. 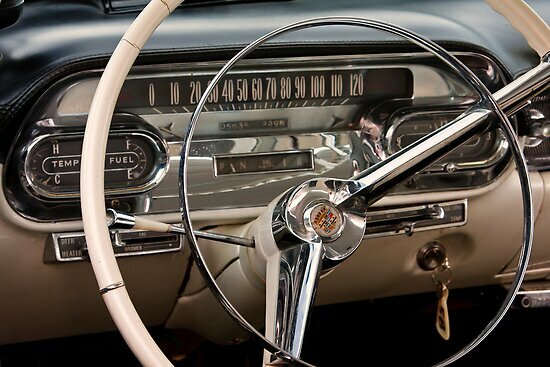 Style, comfort and world-class engineering were hallmarks of 1950's Cadillacs. 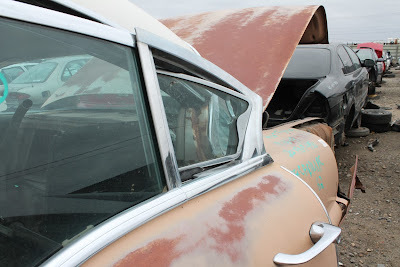 For 1958, Cadillacs featured glorious tail fins that have been removed on our junkyard specimen. But at least that gives us a chance to marvel at just how thick that 1950's steel was. It's no wonder these cars weighed over 4,700 pounds. 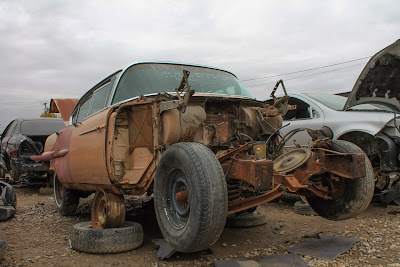 This car has also given up most of it's exterior chrome, its 310 horsepower 365 cubic inch V8 and its entire front clip. Even the DeVille's fantastically jet age dashboard has been removed. 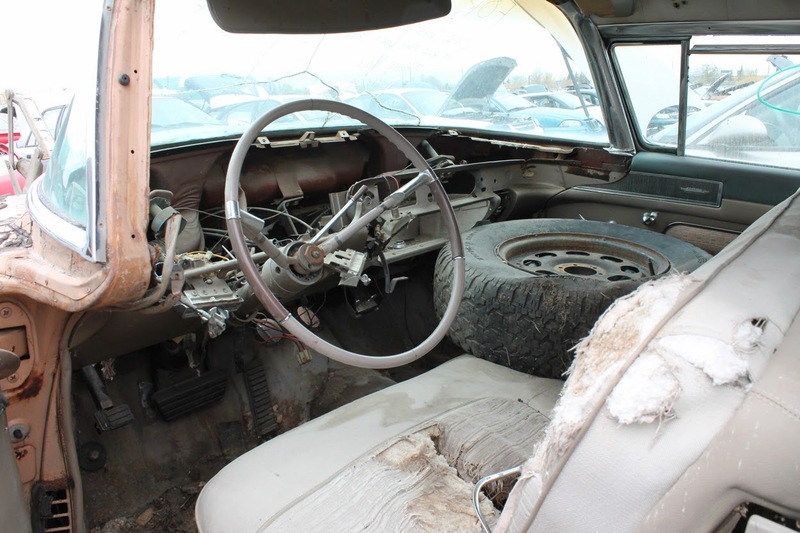 The wide-as-a-Chicago-pizza steering wheel is still in place albeit without its center cap. 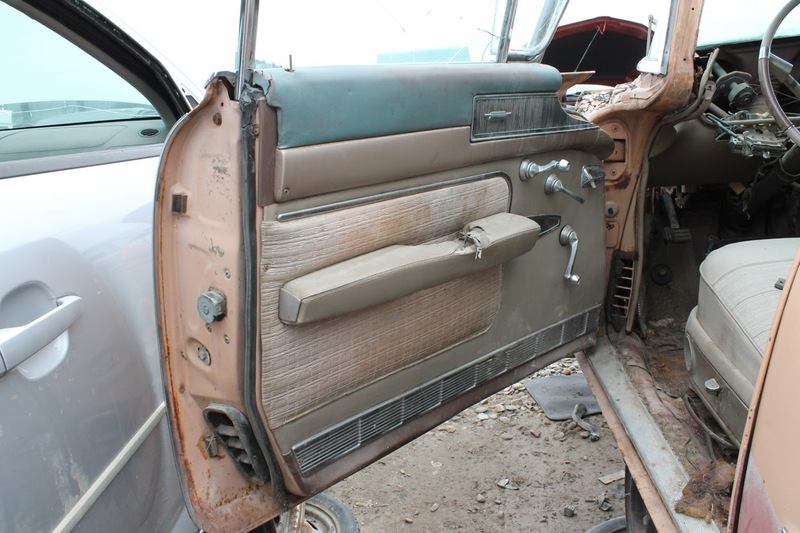 Only the tired door panels suggest the elegance of this car's past. Cars like the Sedan DeVille were designed to be a pleasurable experience from the front seat or the back seat. These rear window vents are an ingenious invention to whisk away cigarette smoke from rear seat passengers. Despite its noble beginnings, cars like this that are missing large amounts of their components and trim are a nightmare to put right and would cost a small fortune to do so. As such, there is very little chance that this skeleton of a 4,700 pound space jet for the land will be returned to any driving form. It has, however, seemingly donated parts so that another majestic Cadillac can continue to drive amongst the living. Somewhere out there, those enormous tail fins live on drawing stares as they have since 1958. Fairwell, Cadillac.